Welcome to Spring Styling Week! I’m joining fellow bloggers to bring you spring decorating inspiration for different areas of your home. 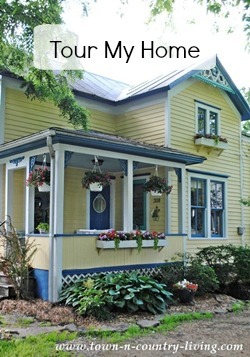 What’s different about this blog tour is that we’re all sharing simple steps to spring decorating. Each day of this week focuses on a certain room. You’ll find all the links at the end of this post. 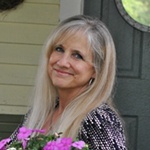 Today centers on decorating living and family rooms. Or in my case, the sitting room. My decorating process is fairly simple and consistent. I start with an inspirational piece (like a painting), or I choose a color scheme. 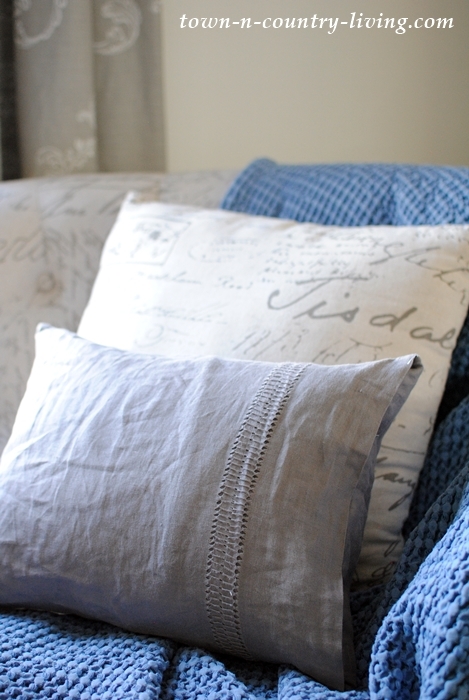 My inspiration for today’s spring styling in the sitting room is a soft shade of blue. But first, let me share where I started. After removing winter decor, I’m left with the bare bones of my sitting room. The first place I start in any room is the biggest piece of furniture. In this case, it’s the script chairs. I like to add throws or pillows or both. 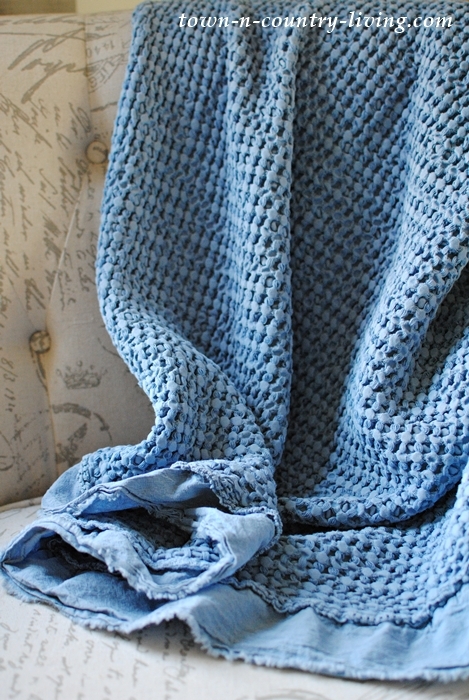 My inspiration is a blue, lightweight cotton throw that I found at HomeGoods. I love the texture and the ruffle, and the color is perfect for spring. I like to have a pillow or two on my script chairs and found a pretty gray linen pillow (also from HomeGoods) that matches the gray in my curtains. Linen is a wrinkly fabric that always looks comfortable and lived in. 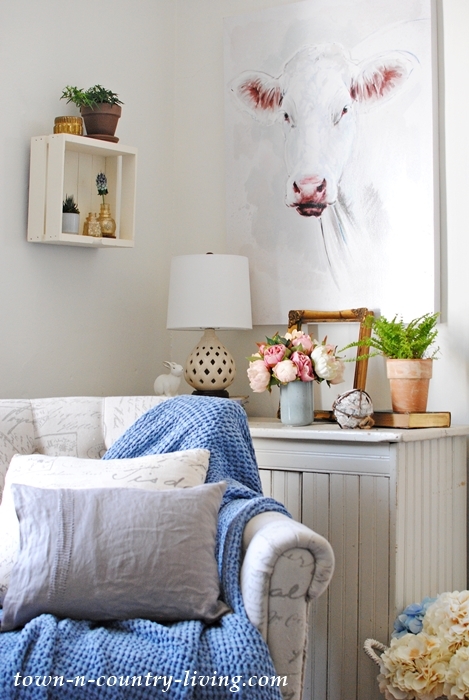 You might decide to swap out existing wall decor to better suit the season. In my case, I wasn’t making any changes on the walls. But still, this needs to be determined before decorating flat surfaces since wall decor can affect the height of pieces on tables or cabinets. Tulip the Cow is staying and so is my little shadow box. The plants and little gold vases were already here. A short gold votive gets added to the top of the box to balance the gold vases inside the box, and a blue thistle flower gets added to the gold vase to tie into the blue color scheme. 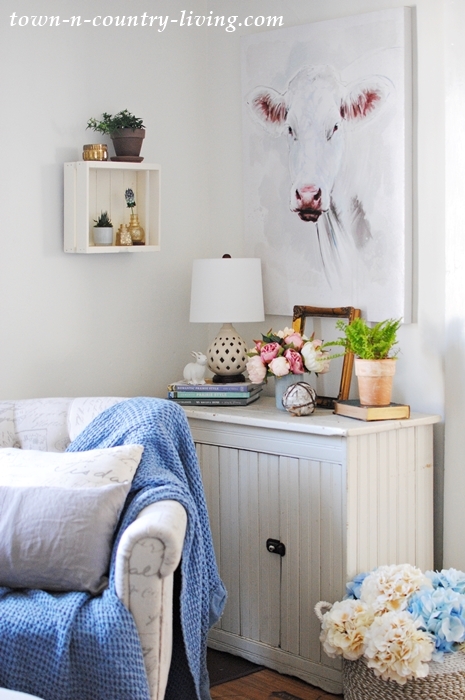 Once the furniture and wall decor are selected, I turn my attention to creating vignettes. 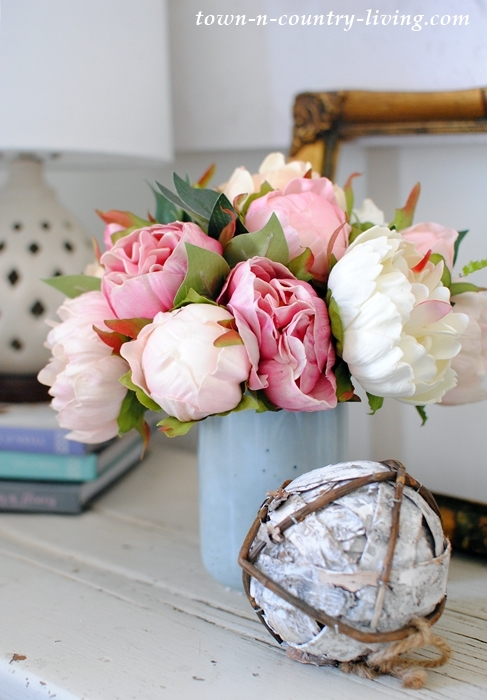 Since blue is my inspiration, I chose a pale blue vase for a bouquet of faux peonies from Antique Farm House. I placed a gold frame behind the peonies for another layer to the vignette. I always try to decorate in layers. Pillows layered over throws. Pretty objects layered in front of mirrors or frames. I think you get the idea. A rustic ball adds a little texture. If a vignette is elegant, I like to add something casual. 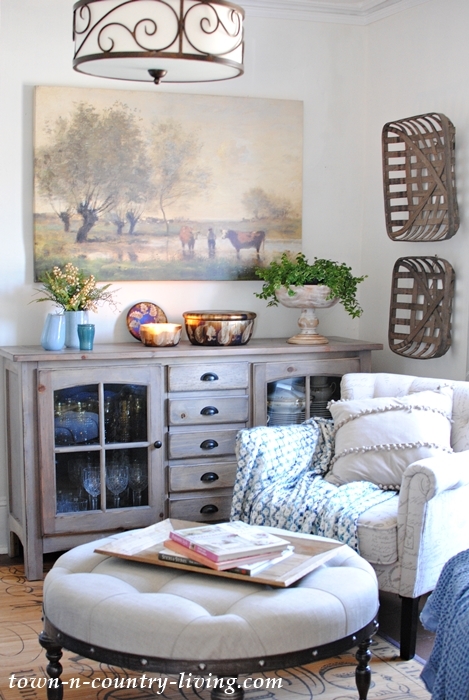 If the vignette is feminine, I like to add something rustic – like the textured ball. 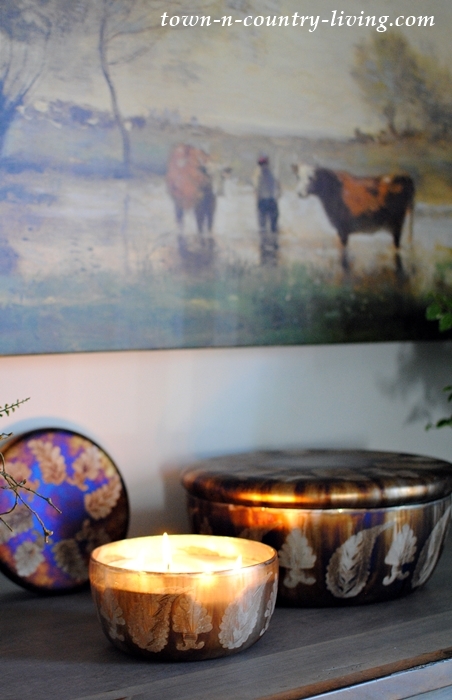 Likewise, if a vignette is casual, I like to add a little bling like a gold vase or silver candle sticks. 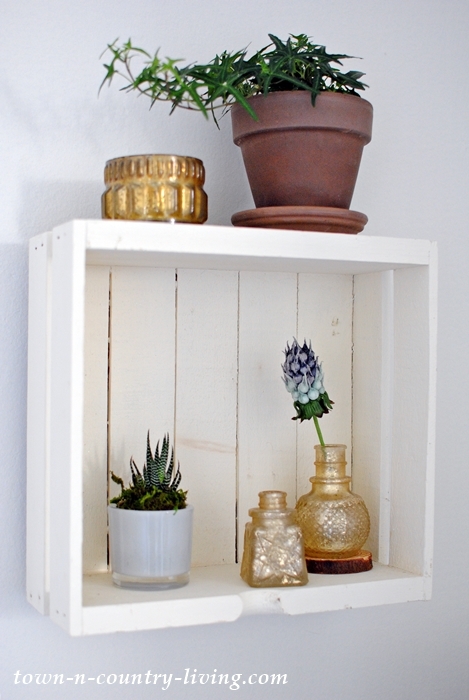 To balance out the vignette on my bead board cabinet, I added a plant on the right side. Since it was a little short, I propped it up on a vintage book. I always like to include plants in every room – they help filter the air. Once the furniture is adorned, wall art has been hung, and vignettes have been created, I finally turn my eye to any lonely areas at floor level. Baskets, plants, and small tables can help to hide any outlets or cords that aren’t blocked by furniture. I tend to choose baskets filled with blankets, pillows, or flowers. 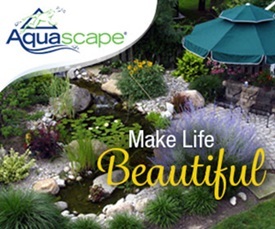 Choose fillers in colors that match your scheme. I opted for blue and creamy hydrangeas from Michael’s. 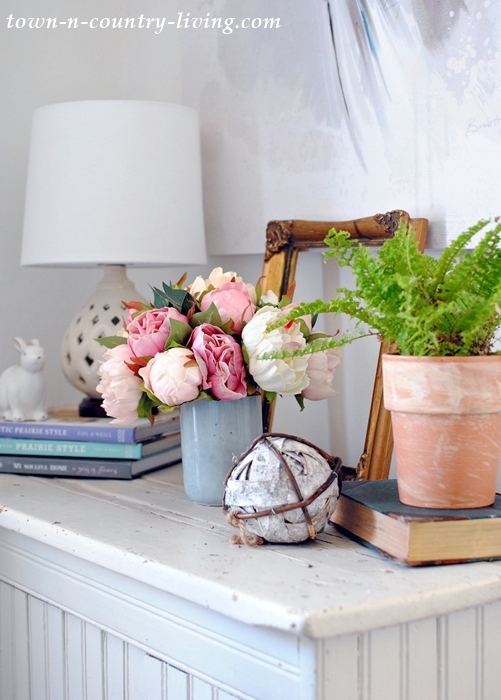 On the other side of my sitting room, I followed the same basic steps to add spring styling to the room. After removing the winter decor, this is what the other side of the room looked like. 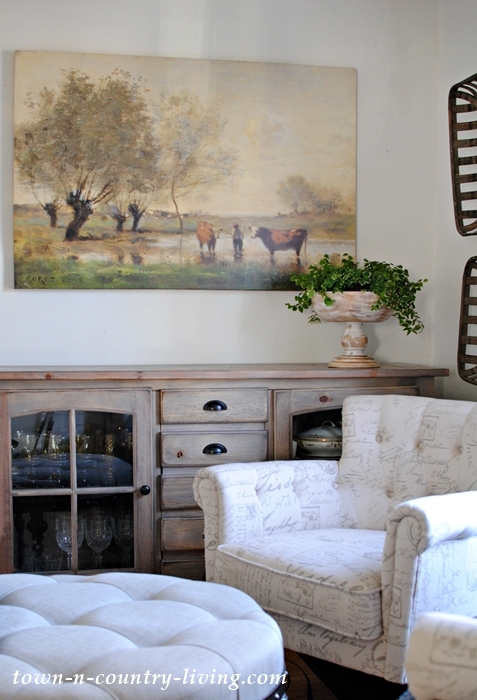 I wasn’t going to change the tobacco baskets on the wall or farmhouse painting, so all that needs to be done is add layers and color to the script chair, and decorate the flat surfaces. 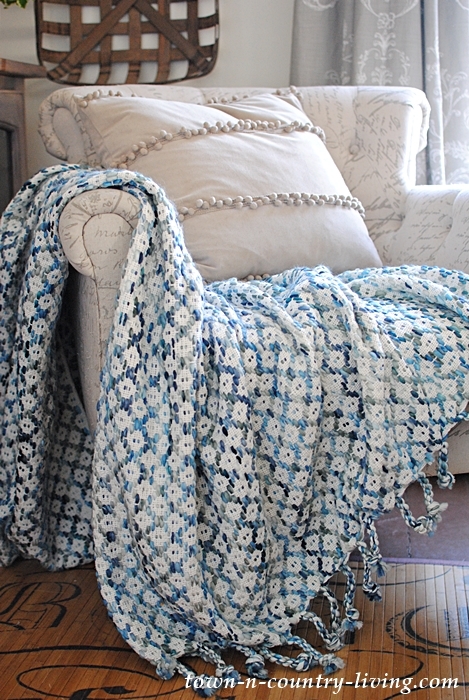 Rather than match the solid blue throw, I opted for a softly patterned throw in blue and white from HomeGoods. My taupe pom pom pillow is added for another layer. I chose a neutral pillow so the throw would be the focal point. We went through my basic decorating steps; now I’ll share simple tips to make your spring decorating job easier. 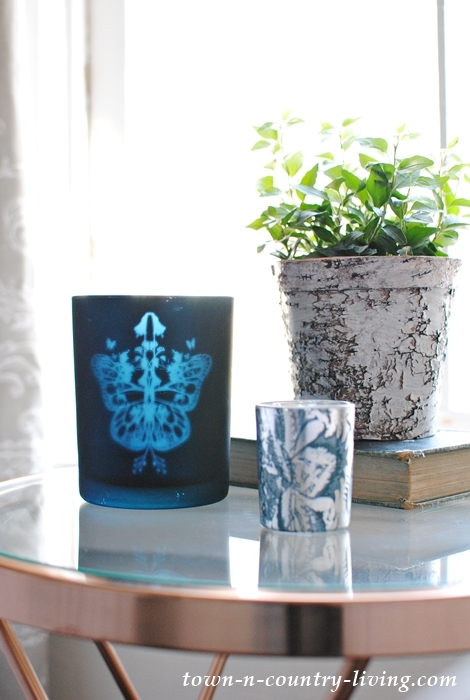 A pretty blue votive joins a pair of soft blue vases. It’s always best to group objects in odd numbers. 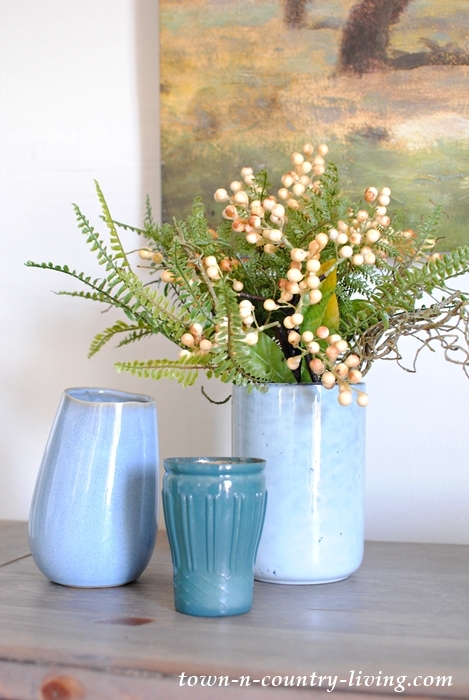 Faux greens, berries, and twigs fill the larger vase. A helpful tip is to shop your home. I moved my favorite Pottery Barn mercury bowl candles in here from the dining room. 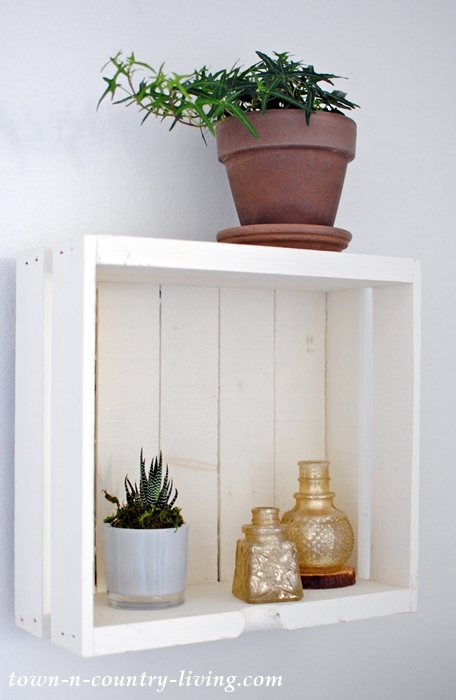 Older items can look fresh and new when you re-group and move them around. The last flat surface to decorate is the metal table between the script chairs. Grouping once again in threes, I paired two blue votive holders with a small plant. 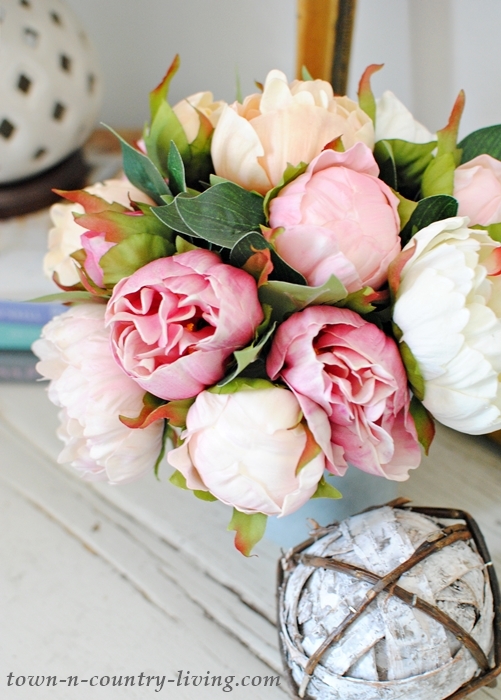 The rustic pot matches the color and texture of the ball next to the bouquet of peonies. I elevated the plant with a book so it’d be higher than the blue butterfly votive. 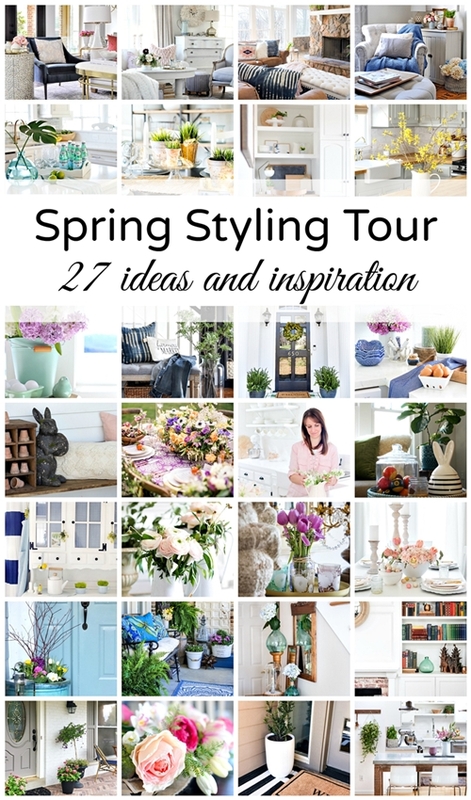 Visit the rest of the bloggers in the Spring Styling Tour listed below for an ample supply of spring decorating ideas and inspiration! 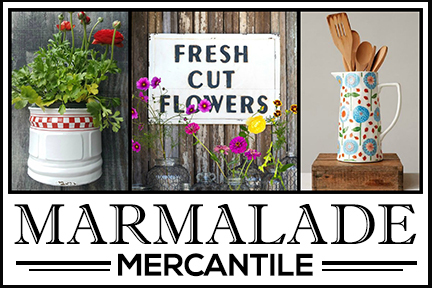 Love that you shop your home too! Bring on spring! Down to the “bare bones’ then you added the touch of spring. Your chair and ottoman look so inviting. I believe anyone would feel very welcome in your home. Thanks, Kristin! Sorry you weren’t able to join in this time around. You have helped me so much with all you tips and the way you style your rooms.You truly make your home and each room be what they are. Thanks so much, Marlene. I guess decorating has become my creative outlet. I never seem to tire of it! Lovely and cozy sitting room Jennifer! I just love this tour idea! It’s so fun to see everyones process so far. Thanks, Cami! I’m looking forward to the rest of the week’s inspiration! Thanks, Cindy! I always find something at HomeGoods. Thanks for stopping by! Great transformation Jennifer and shopping our own homes is the best. Thanks for organizing such a great tour! Thanks, Janet! 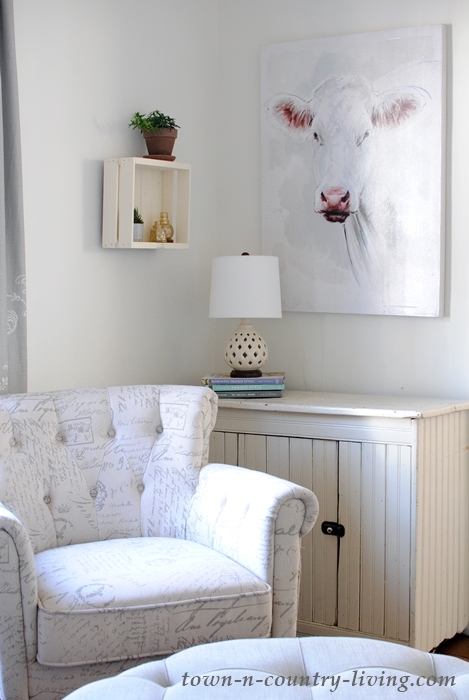 Loved your living room refresh! You have a great style sense! I love the transformation, Jennifer! Your simple touches of spring makes the room look fresh and airy 🙂 Happy Spring! You have such an inviting home Jennifer! 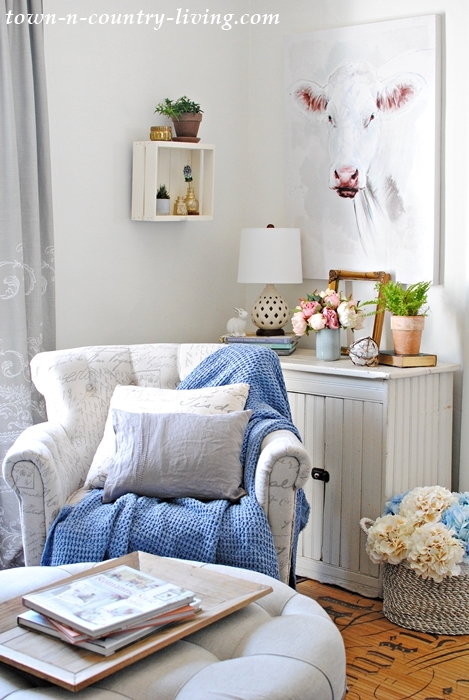 The chair with the darling taupe pom pom pillow looks so cozy! Beautiful spring room! I absolutely love your sitting room. In any season. And I’m kind of jealous about all the added storage you have now. This room and the rest of your home are totally inspiring! Thanks for the tips you shared.